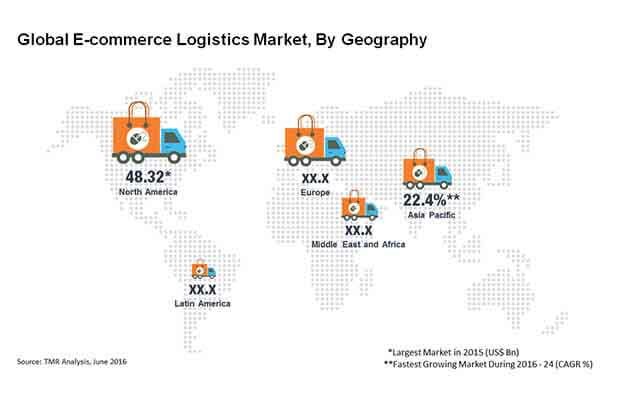 The global e-commerce logistics market was largely dominated by two leading players DHL International GmbH and FedEx Corporation who held 50% share in the global market in 2015. XPO Logistics and United Parcel Service Inc. are the other two companies functioning in the global market but contribution is far less than the first two mammoth companies are. Some of the other players operating the global e-commerce logistics market are Clipper Logistics Plc., Gati Limited, Kenco Group, Inc., and Aramex International. Several leading players in the market tapping the regional market in emerging economies such as in India and China. The promising growth potential offered in the e-commerce logistics market is likely to draw interest of new players that could help them grow extensively. Route optimization and innovative parcel tracking are strategies used by new players to attain a competitive edge in the market. According to TMR, the global e-commerce logistics market is anticipated to reach US$781 bn by the end of 2024 progressing from US$122.2 bn earned in 2014. During the forecast period between 2016 and 2024, the market is projected to rise at remarkable 20.6% CAGR. Based on service type, the transportation segment held maximum share in the market in 2015 and was greater than the warehousing segment. The importance of transportation is more in the whole chain of e-commerce logistics process and it is gaining more and more importance as various large and small companies are focusing on last-mile delivery. On regional front, Asia Pacific is leading the global e-commerce logistics market as 60% of the global population resides in this regions who have created increased the overall demand through e-commerce medium. North American and Europe also offered lucrative opportunity due to excellent digital infrastructure. Recent technological advancements have increased working efficiency in various sectors. One of them is e-commerce logistics. Massive growth in internet penetration, burgeoning cross-border e-commerce activities, and increasing focus on emerging economies are some of the major reasons behind the growth of e-commerce market at the global level. Moreover, adopting modern way of doing B2C e-commerce business is widely adopted by various companies. This B2C e-commerce business model forces the players to modifying their business model various times in year. Massive growth of innovative technologies is the key factor for the growth of the global e-commerce logistics market. Adding further, rising number of e-commerce startups in India, Brazil, and Mexico is likely are expected to provide fillip to the e-commerce logistics market. One of the major challenge faced by the players function in the e-commerce logistics market is infrastructural issues in emerging economies that hampers the service of last mile connectivity offered by them. In addition, when customer order online keeping the minimum limit in mind and then after receiving they return the unwanted product has high impacted the market players. It is mainly done to avail various offers initiated by companies. But this put pressure on the chain of reverse logistics and triggers the expenses incurred by the companies in this market.